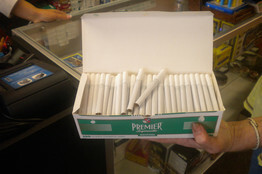 Aside from the bewildering variety of smokes (“I’d like a pack of Pulmo 100 Lites in the fliptop box and carrying case. No, no, the green pack, stupid’’), the question for the tobacco retail clerk quickly becomes, why is anyone still smoking who does not roll his own? Scores of tobacco retailers in the U.S. are taking advantage of a federal tax loophole to offer deep discounts on roll-your-own cigarettes. But the practice is attracting scrutiny from regulators and cigarette manufacturers. At Smoke Zone, a store in this Chicago suburb, customers one recent afternoon flocked to two high-speed rolling machines that produce a carton of cigarettes in eight minutes. The price: $21—less than half the cost of a carton of Marlboro cigarettes. This substantially reduces the stores’ and smokers’ costs because the federal excise tax on pipe tobacco is $2.83 a pound—compared with $24.78 a pound for the rolling tobacco traditionally used to make hand-rolled cigarettes. In the 14 months since the tax increase, the volume of pipe tobacco sold in the U.S. more than tripled to about 21 million pounds, according to data from the U.S. Treasury’s Alcohol and Tobacco Tax and Trade Bureau. Rolling-tobacco sales volumes, in contrast, fell about 60%. There are no smarter marketers in the U.S. than tobacco companies. American tobacco companies spend about $15 billion a year on marketing. This entry was posted in Uncategorized and tagged Boston Globe, pipe tobacco, roll-your-own cigarette machines, rolling tobacco, Wall Street Journal. Bookmark the permalink.